The goal in a young doctor's wife is clear. It even has a specific milestones and dates. Survive medical school, internship, residency, and fellowship to enjoy the payback of that first REAL paycheck. But, during those tumultuous years, life happens. Life happens fast. Marriage, learning to deal with one another's quirks, learning how to deal with the stressors of medical training, education and careers are put on hold, babies come along who cry, poop, vomit, and also love, bills and debt accumulate, family birthdays are attended solo (even wedding and funerals), vacations are skipped, and the other parents at school assume you're divorced, because your DocH has never been able to attend any school function. And, all that is meet with a stiff upper lip, because of the mutual understanding of medical training rigors... and the knowledge that it will all be *over* one day when training ceases. So... we wait. But, let me warn you, dear friends, for many of us it NEVER ends, and money, unfortunately, doesn't bring happiness. Sure, the hours get better. He is home for a late dinner. But, he spends his free time in front of the computer charting or attending to the "business" medicine. If he is truly type A and has that desire to climb to the top of whatever mountain stands before him, he will always be attending dinner meetings, writing papers, piloting programs, joining committees, boards, directing leadership groups, and attending conferences. Whether he's building a practice or climbing the hospital's administrative ladder, his focus will always be up rather than down, in the here and now. *It* always continues. I came to this realization over the last couple of years, and like many med school wives, I simply shifted my focus down the med life timeline. For me, that meant looking towards retirement which is just over a decade away. But, even that was wishful thinking. I've come to peace with the realization DocH will never fully retire, he may slow down, he may not work full-time, but he will never fully relinquish his life and love of medicine. My point? Let's all stop waiting and just get on with our lives as best as we can. Let's support them and love them, but let's not forget to support and love ourselves in this journey. Let's not forget to feed ourselves with whatever energizes us, and nourishes our souls so we may bring happy to our lives, our marriages, and our families, because waiting does nothing for us. This post is exactly what I needed to hear today. 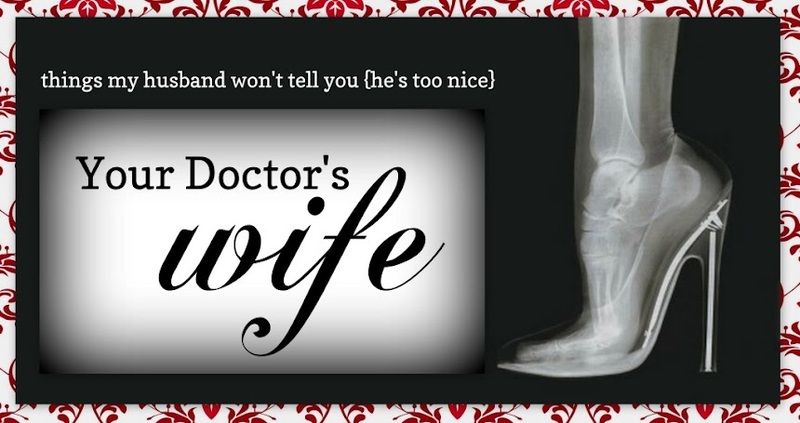 I'm at the very beginning of the doctor's wife process with my husband just about to start applying to schools. All I have thought about is the wait and the perfect timing for things. Thanks for reminding me that waiting does nothing just like worrying. Hmm.. This made me kind of sad. Maybe because I'm in the thick of the waiting with hope (hopefully!?) on the horizon. I'm a mom of one and prego with baby #2. DocH is a 3rd year resident, has one more year of residency this July then next year we move across the country for fellowship. This year has been crazy because of the amount of studying he's done over the last year in preparation for his Boards exam (his residency takes boards end of 3rd year) in addition to normal residency life and moonlighting to top it off! I'm so grateful for and proud of my hard working husband! He keeps reassuring me that it'll get better after boards. Then that fellowship will leave him with more free time than residency (he's radiology). Knowing him tho and his perfectionistic tendencies and never settling I wonder sometimes if it will. I feel like there's always SOMETHING. And even next year when the Boards aren't hanging over his head it'll be something else, then something else. I'm exhausted and really wish I could have my husband back. His residency took us far from family and friends so it's been so isolating and difficult. Thank you so much for writing this- it is a message that I really needed to hear... My husband is an MS 2 and I've been dreading things getting even busier with school in third year during rotations, and then away rotations during fourth year. We have a one-year-old son who keeps me busy but it's so hard to figure out how to have my own (almost) separate life while he is busy (which seems to be all the time.) And then I know residency is going to be even busier...I'm just hoping it will eventually get a little easier. Thank you for this reminder! Exactly what I needed to hear/read today. I'm so glad you're back to blogging! Thank you! Glad to be back!! Thanks for following along!! This is great!!!! I couldn't have said it more perfectly myself! Mine never truly slows down, and it's easy to forget that it is just who he is. :) Thanks for posting! !